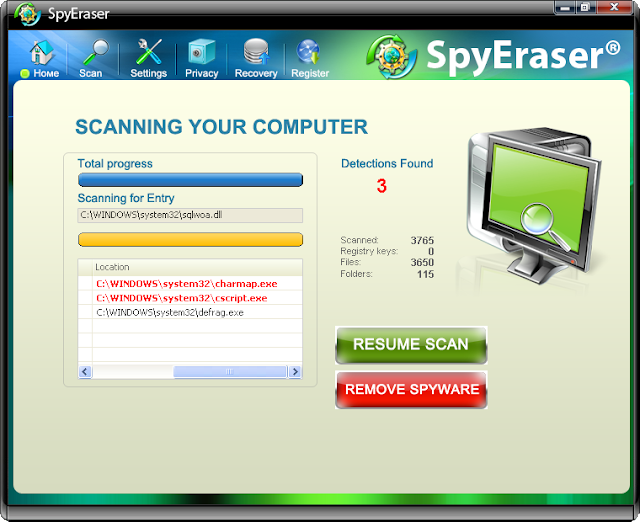 MyPcSecure comes from fake online antivirus scanners or fake video codecs, creates random files on the system and detects them as infected. It also display a lot of disturbing warning messages to scare users. Antivir 2010 is a new fake security application. 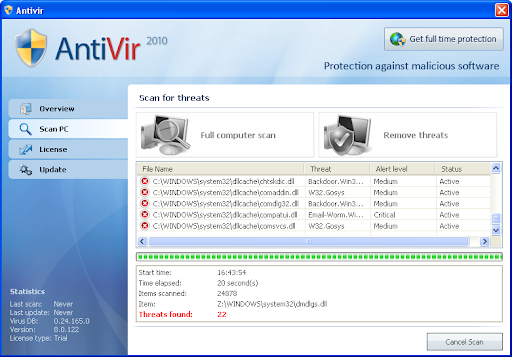 Antivir 2010 takes its name from the real Antivir Antivirus by Avira. 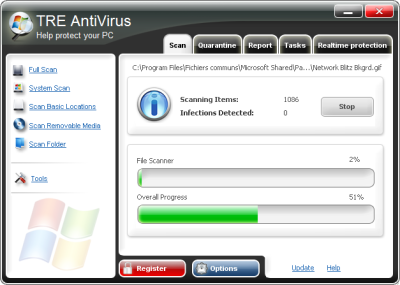 Antivir 2010 detects fake infections on a clean system to scare users. It also installs a BHO to display error messages in Internet Explorer. 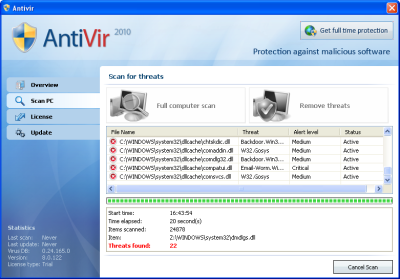 If your PC is infected with Antivir 2010 use MBAM to remove the infection. PcSecureNet comes from fake online antivirus scanners or fake video codecs, creates random files on the system and detects them as infected. It also display a lot of disturbing warning messages to scare users. 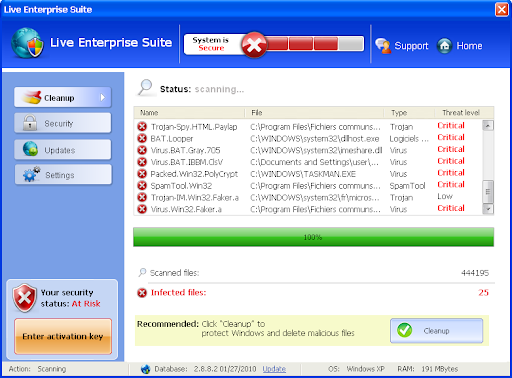 Live Entreprise Suite is a fake security application. 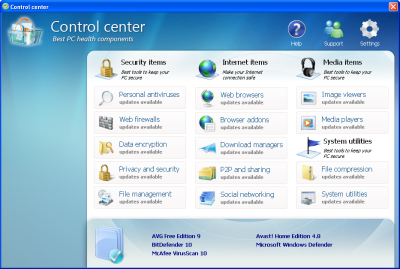 Replaces Internet Antivirus Pro. Live Entreprise Suite detects fake infections on a clean system to scare users. Installed from fake online security scanners, it comes with TDSS RK. If your PC is infected with Live Entreprise Suite, follow the BleepingComputer removal guide. 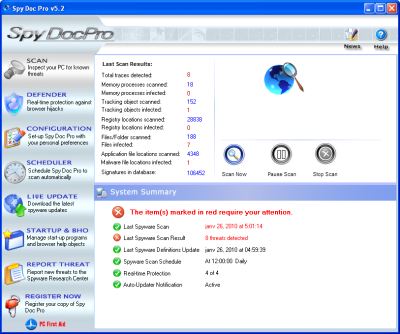 SpyDocPro is a fake security software. 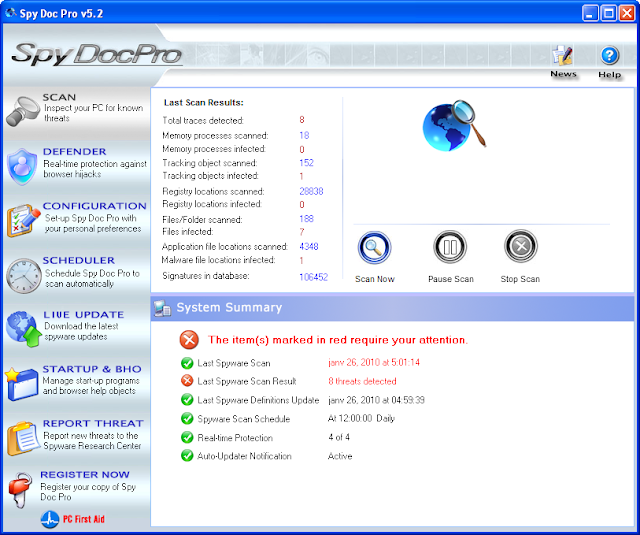 It is edited by the same editor who release PC Doc Pro. Registry Elite is a fake registry cleaner. 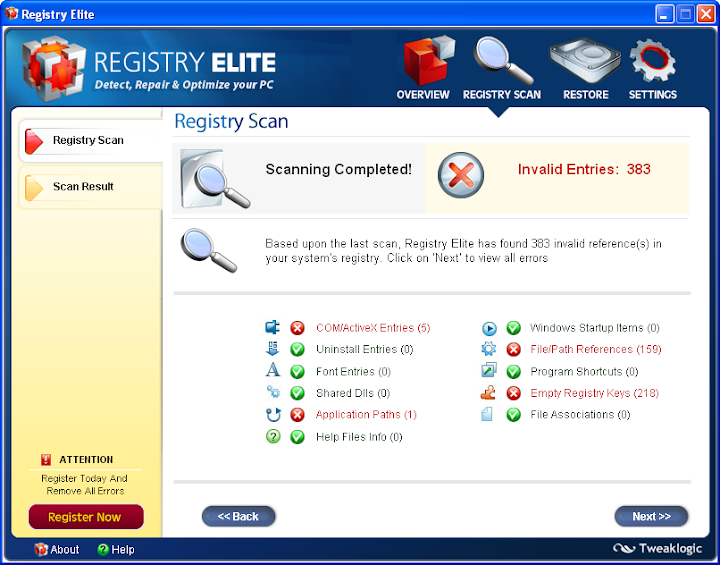 It detects Fake registry problems, file association errors and other symptoms on a brand new system (383 errors on this capture test (Windowns XP SP3 installed few minutes ago). 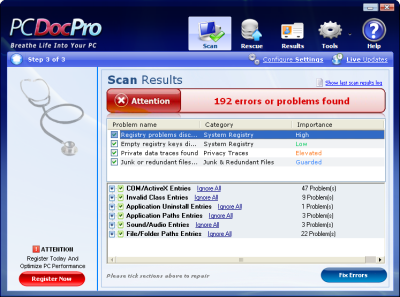 PC Doc Pro is a fake registry cleaner. It detects Fake registry problems, file association errors and other symptoms on a brand new system (192 errors on this capture test (Windowns XP SP3 installed few minutes ago). PcsSecure comes from fake online antivirus scanners or fake video codecs, creates random files on the system and detects them as infected. It also display a lot of disturbing warning messages to scare users. 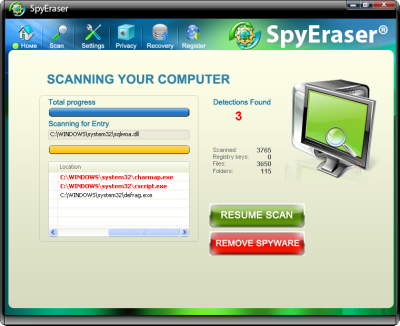 SpyEraser is a fake security software. It detects non existent infections to scare users pushing them to buy a license. Desktop Security 2010 is a fake security software (rogue). It is from the same family as: Total PC Defender 2010, Desktop Defender 2010, Contraviro, UnVirex. Desktop Security 2010 displays a lot of disturbing warning messages pushing users to purchase a license. 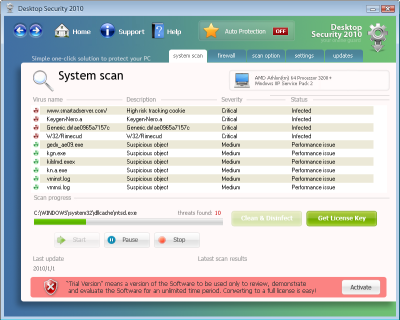 If your PC is infected with Desktop Security 2010 rogue, use MBAM to remove the infection. 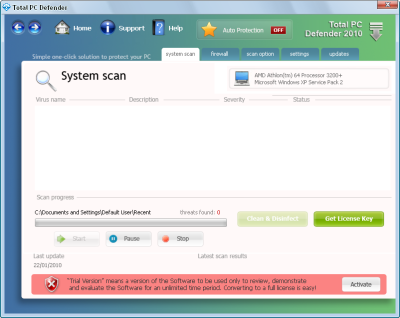 Total PC Defender 2010 is a fake security software (rogue). It replaces Desktop Defender 2010. (Contraviro and UnVirex family). 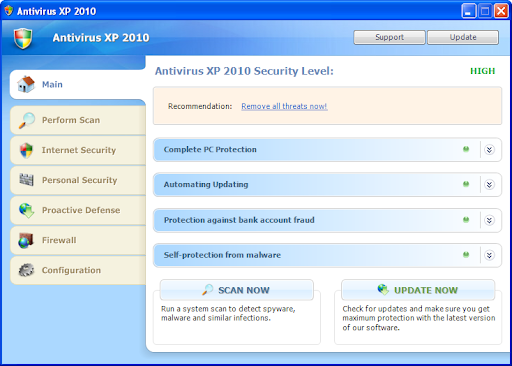 Total PC Defender 2010 displays a lot of disturbing warning messages to scare users inviting them to purchase a license. If your PC is infected with Total PC Defender 2010 rogue, use MBAM to remove the infection. APcSecure comes from fake online antivirus scanners or fake video codecs, creates random files on the system and detects them as infected. It also display a lot of disturbing warning messages to scare users. Protect Soldier comes from fake online antivirus scanners or fake video codecs, creates random files on the system and detects them as infected. It also display a lot of disturbing warning messages to scare users. 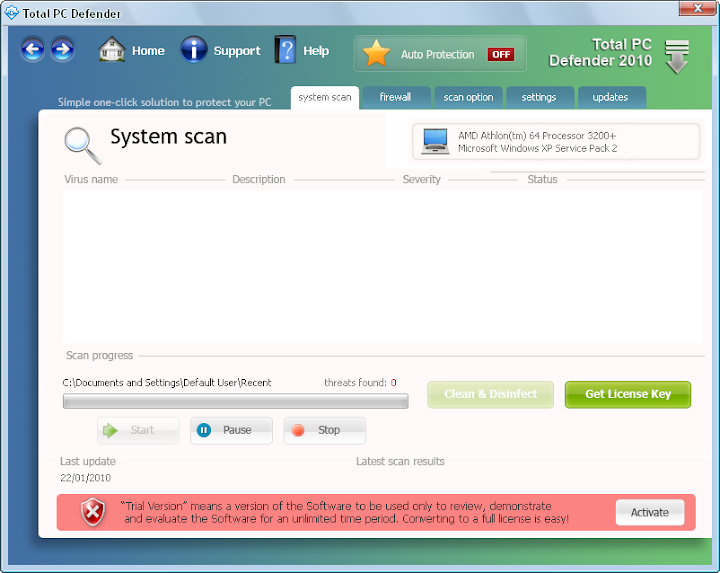 If your PC is infected with Protect Defender, use MBAM to remove the infection. 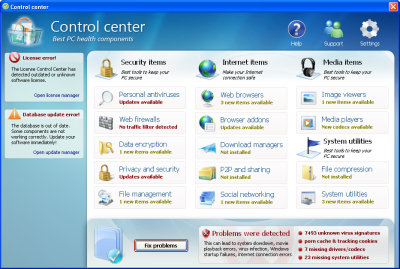 Internet Security 2010 is a recent rogue that prevent softwares and media players execution. Your system is infected. Please activate your antivirus software. Do not delete the LSP File without unregistering it, you will break the Internet connection ! 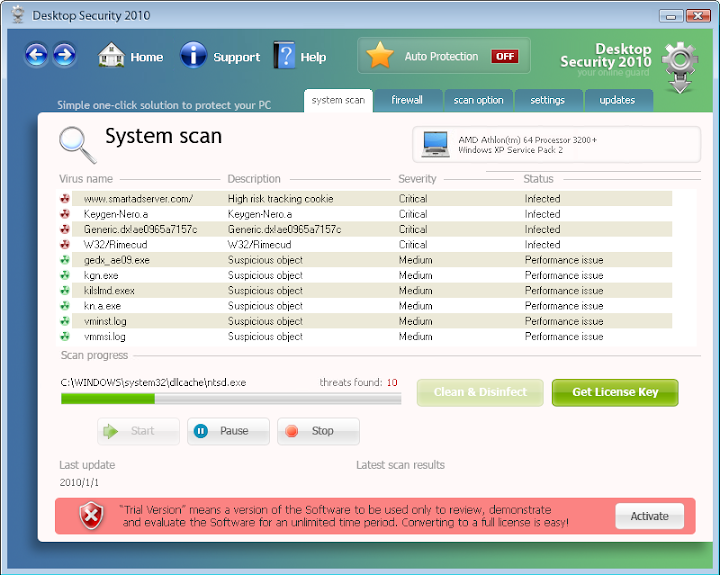 If your PC is infected with Internet Security 2010, use MBAM to remove the infection. Protect Defender comes from fake online antivirus scanners or fake video codecs, creates random files on the system and detects them as infected. It also display a lot of disturbing warning messages to scare users. Armor Defender comes from fake online antivirus scanners or fake video codecs, creates random files on the system and detects them as infected. It also display a lot of disturbing warning messages to scare users. 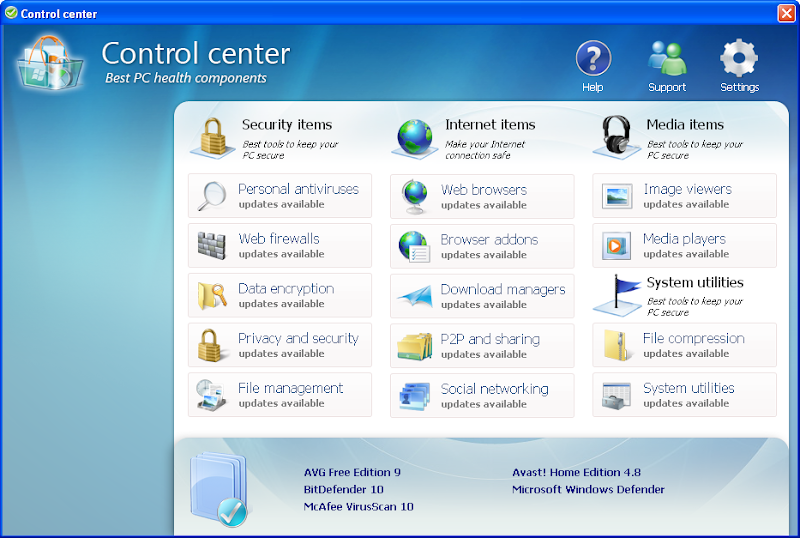 Control Center aka Ctrl Center is a fake security application. This rogue displays fake warning messages pushing users to buy a license. It replaces Privacy Center. By selecting some of them, no one has ever start downloading. There is also some bugs: some categories display non related tools. 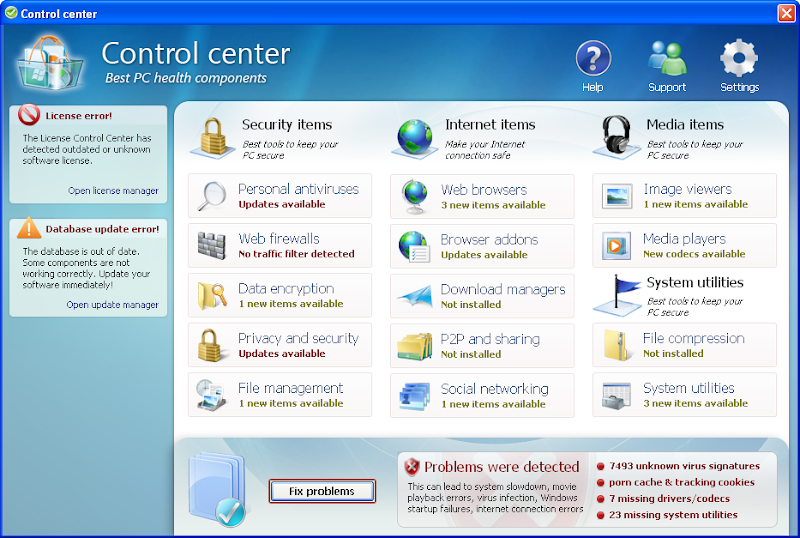 If your PC is infected with Control Center use MBAM to remove the infection. Personal Security is a fake security application. This rogue detects fake infections, trying to push users to buy a license for disinfection. Like Alpha Antivirus, Personal Security uses an Anti Virtual Machine protection (same code) to prevent execution on a Virtual System (video). 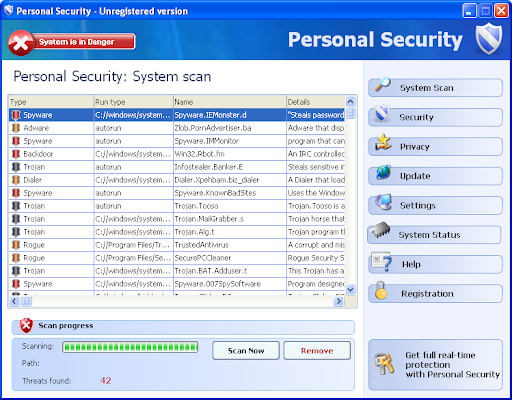 If your PC is infected with Personal Security use MBAM to remove the infection. Ghost Antivirus is a fake security application. It detects fake infections on a clean system to scare users. If your PC is infected with Ghost Antivirus, follow the BleepingComputer removal guide.